You'll have read elsewhere that Icahn has popped onto Yahoo's radar. He's put some cards on the table - 3% of Yahoo's shares and a move to put his team onto the board. 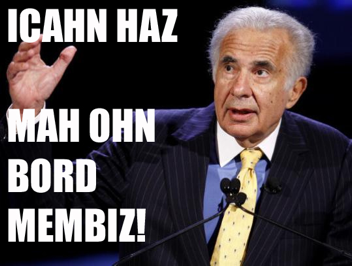 Full marks go to Marketing Pilgrim and their lolcat inspired write up - Icahn Haz Yahoo Board!. (Picture Credit to Marketing Pilgrim too) This isn't a news blog so I'm not going to mull too much into the details except to say that the term corporate raider was pretty much invested for Icahn. Er, I mean, Mr Icahn. In other news CBS bought CNET. Wow. Old schools swoops in and buys new school. Once again I'll let someone else explain why that's odd - how come CNET was sold for less than $2 billion when it was worth nearly $20 billion just a few years ago. This time it's Mr Arrington who's explaining why CNET isn't the one buying CBS. Here's the thing... Icahn has had some involvement with CNET himself. I think it's an excellent illustration of what Yahoo now face (and a time when Microsoft is lurking somewhere in the shadows...). In the States there is a law called the Hart-Scott-Rodino Act. The Act means you've got to own up and say when you've bought more than 5% of someone's shares. Have you ever played cards with someone only to discover, all of a sudden, they've won the game... they've got rid of their last card and you didn't see it coming. You didn't see it coming because they kept their hand hidden under the table. The Hart-Scott-Rodino Act is designed to stop companies being bought in the same way! With the Act in place no single person can buy a dribble of shares here, a dribble of shares there and sneak into position of strength. Although; it's worth noting that Icahn (Mr) has 3% of Yahoo and is still in a position of strength. Given the Hart-Scott-Rodino Act you can imagine CNET's surprise when, all of a sudden, they worked out that someone had managed to sly a full %21 of their company! No. Icahn didn't lead the charge but he was involved. It is possible for hedge funds to deal with one and other and buy shares for one another. For example, you might buy some Yahoo shares for me - and you'll own them. We'll sign a deal that at a pre-arranged time you'll sell them on to me. We'll work it so that no one looses out if the shares go up or down in value and in exchange I'll pay your a handling fee. That's what happened to CNET. Mr Icahn was one of the players in the elaborate series of "phantom buyers" who bought shares in the snare the hedge funds circled around CNET. The New York Times has a more thorough write up than I do. So Yahoo... Mr Icahn holds %3 of your shares. I wonder how many of your shares his allies hold and have already signed over.